Impressed and inspired by these brilliant christmas crackers by Kate from Mini-eco, I thought a similar structure would work really well to create candy-shaped party favour boxes. And, of course, I've dressed them head to toe in delicious candy stripes! 'Cos you gotta love candy stripes. Download the PDF (below). The box comes in two sections. One side should fit snugly into the other to close. 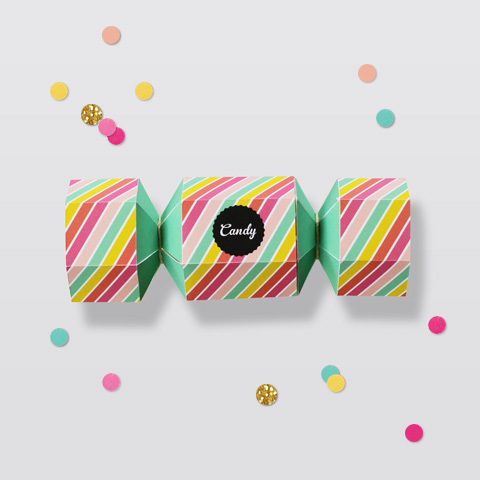 Print out both sections of the candy box onto 2 pieces of thick white card stock. (The thicker the card, the more expensive, but the better the result, in my opinion.) You can also use glossy photo paper if you would prefer a shinier texture. Use your x-acto knife to score gently from dotted line to dotted line (where the folds will be). Use your knife, ruler and cuttting board to cut them out. Put your candy in a small paper/plastic bag or wrap and secure. Stick the candy into the section without the 'candy' wording. Slide this section into the end of the other section to create your completed box. The PDF is a 2 page document. If you have issues downloading try right-clicking ('Ctrl' and click for the mac) on the download button and saving directly to your computer. And if candy stripes are really not your thing, you can alway try the awesome template from Mini-eco which you can use on any paper of your choice! Every time I visit your lovely blog Im convinced that I need to throw a fabulous party or brunch so I can utilize all your amazing DIY projects and adorable printables! I love this idea and couldn't agree more about the candy stripes. Yum! I like your post a lot and I believe you're a terrific graphic designer with a great style. I am looking to study graphic design as well some day hehe. I wanted to ask you what kind of camera do you use. I want to buy one myself but I don't know which one is best and I really love your pictures so I guess the one you use is a good option. Thank you for sharing. I am a new visitor and I now plan to spend a while looking around. Cute!!!! I have only just discovered your blog, and am so in love. My sister's birthday was a couple of weeks ago, and I was looking for an interesting way to deliver one of her many presents- a bag of jelly beans! I recently stumbled upon this template - what a lifesaver! I printed it onto A3 paper so the finished bon-bon was larger, and therefore fit more jellybeans. She absolutely LOVED it!! I just tried it out and it came out amazing!! I've print this to offer the gift of my birthday'sister. Loved this idea too!!! Plain excellent for my niece's bday party! HI. i'm so sorry to ask for this as I'm embarrassed but can you please PLEASEEEE make a step by step photograph section ??? I'm so in love with the box I even bought the paper you said BUT I CAN UNDERSTAND HOW TO DO IT OR WHERE TO CUT!! Thank you and if not, well thanks for your time.. BEAUTIFUL THINGS! keep like that beauty ! Beautiful ideas and freebies! I just wanted you to know I tried to in multiple items on pinterest but for some reason it wouldn't let me fetch the image. Thank you for the inspiration! 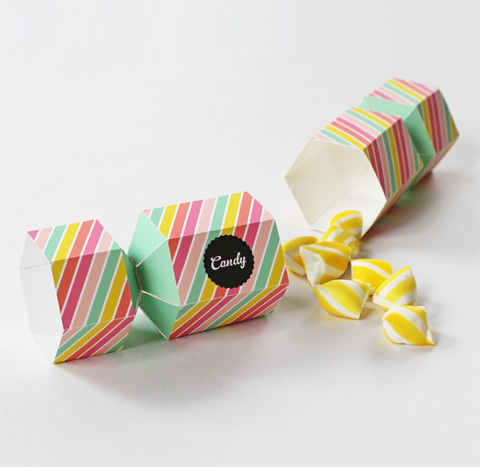 Wow…very beautiful idea of to create candy-shaped party favour boxes. Thanks you so much for sharing such a beautiful DIY. So we can play jigsaw puzzles on a one click you need to do nothing just go and play. Do you know that https://essaydragon.com/blog/exploratory-essay service has a discounts and you can get your essay done almost for free? this is incredible! The free roblox game is one of th most awesome and thrilling game ever with the all new features embadded init like easy robux hack obux cheat codes etc and these are available on http://rbxgenerator.com so hurry guys go and get it. These candy favors are so cute and appealing to the eye what a wonderful and fun idea to hand out at a party thank you for the free label template https://thedissertationhelp.co.uk/.